INTERESTING, HELPFUL, AND IMPORTANT ALL-THINGS-CAT BY E-MAIL! 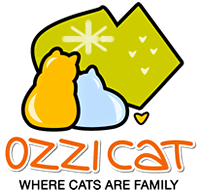 How did you find out about Ozzi Cat? Somebody's web site, Facebook, Friends, other? This field will save only 200 characters (~50 words). If you would like to share more details, after signing up please contact us via the Contact Us form on our web site. (Humanity Check) How many days are in a week?